A controversial public toilet mural will not be removed, despite being deemed a "degrading and disrespectful mess" by some. 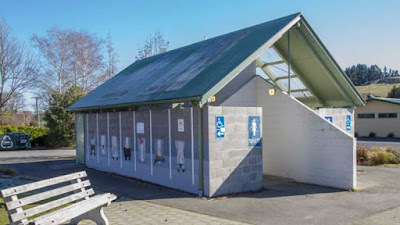 The mural on the public toilets building in Cheviot, North Canterbury, New Zealand, depicts men's and women's legs with underwear around their ankles. The Hurunui District Council fielded several complaints in August over the commissioned work when painting began on the women's side of the facility. The council reported: "Initial feedback received via social media raised concerns that the images depicted were sexualised and were therefore inappropriate for public display." Complainants were asked to withhold their judgement until after the "tongue in cheek" mural was finished. Council team leader customer and information services Naomi Woodham said the mural had since been completed and was proving to be an attraction. "Several people have told us that they actually went up to Cheviot specifically to visit the loos to see what all the fuss is about," she said. "Since the initial handful of people that took issue with the incomplete mural, there have been no further complaints, in fact there has been a considerable number of compliments." Hagar New Zealand operations director Sarah Scott Webb said their original concerns about the image, and its role in helping to feed sexualisation and objectification messages, were still there. "We are a frontline organisation that deals with victims of paedophilia and sexual abuse, and often public toilets are a breeding ground for this to happen. With any decisions like this, with any images like this, the question needs to be asked if it actually helps the safety and protection of young people or not. I'm not sure these images do." Council officers reviewed the process the Cheviot Ward Committee undertook prior to the mural's installation and was satisfied "proper process was followed". Complainant Marianne Beker​ said she was disappointed the council had not changed its stance. "As a women I don't think it does anything for the safety of women to have their pants round their ankles." Others praised the council for "being a little creative". In a written statement to the council, John and Susan Collins encouraged those against the mural to "treat it as art, look, ponder, think, love or hate. That is the purpose of art to entertain, reflect, create conversation, and so expand our perception of the world we live in," they said. "Our grandchildren are planning to come down from Nelson in the next school holidays specifically to look at the wall, so please leave it for them to look at and enjoy." Don't know about other women, but I certainly do not drop my knickers all the way to the ground. Public toilets are disgusting, especially in female toilets. Although I don't think it's entirely necessary, it is depicting reality. You can't hide everything from your kids.